Software development often begins as a one off, fixed term project - however, as demand increases, it frequently becomes and ongoing agreement for development and maintenance. Use this document to ensure both parties are protected. 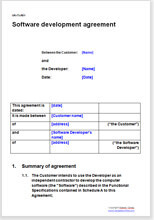 One time arrangement providing blanket terms and conditions for recurring performances of the Developer is the concept contemplated by this Agreement. By executing this Master Software Development Agreement, the Client engages a Developer to perform on Software Development projects through Work Statements issued by the Client from time to time as per the needs of the Client. This document will cater to a long term business arrangement between a Client and a Software Developer engaged to perform on a variety of Computer Software Development projects. A developer capable of providing such and similar services to a foreign/local company or business in a long term business arrangement and not for one specific project. Detailed explanatory notes to help proper execution and implementation.